As most (landscape) photographers I have a shortlist or a bucket list in my head of locations that I want to shoot someday. I don’t know how but lately I somehow seem to have set to visit some of these locations. This time it was the turn of the number one on my list for as long as I can remember. I must have planned for this trip for at least three years now and I always have considered it a winter-sunrise location. Because of this and my other activities in the morning (work, kids) I never really set out to actually go. Then I acquired the smartphone app Photopills and started to play around with it. The features of sunset and actually being able to see the direction of the sun at a certain date and time are great but what I really loved is that you can save locations as a ‘Plan’. I started to save my bucket list items as ‘plans’ and suddenly they became real plans. They weren’t some stupid ideas but became tangible executionable plans. Playing around in Photopills I noticed that in May, during sunset, the sun would be perfectly aligned with the small pier the lighthouse of Marken was built on, that kind of gave me an excuse to go. I started to look online for other images at this location taken during sunset and actually loved more than a couple of them. I created a gallery in 500px and started to make a collection of images that gave me an Idea of what I wanted to capture. Then I emailed a friend if he wanted to join me on my trip and that just made things definitive we set a date and off we went. The Isle of Marken is not very far from where I live, but you have to walk the last KM’s from the parking since you are not allowed to drive across the island. On our way over in the car we both noticed the change in the landscape. The area that I live in is busy with many buildings and houses even when you are out in the countryside. Over here it just felt more spacious and wider… And driving towards Marken really made us notice the change. My anticipation was rising with every step as soon as we left the car and embarked on the small walk to the lighthouse. The wide view was refreshing and in the distance you could see the lighthouse partially obscured by the dyke. Every step revealed more and more of the lighthouse and we were enthusiastic about the conditions. Walking up the low dyke the scene finally revealed itself, a moment I had been anticipating for a long time. I took a couple of minutes to soak it all in and enjoy the moment and then grabbed my camera and set out to shoot… We were treated by awesome light terrific pink skies and the whole experience was amazing. I could not believe that I was finally there. And I could not believe why I had never done this before? It was so easy getting there!!! I am rather surprised to find that I shoot into the sun most of the times and don’t really use other forms of light. Mental note, shoot under more different light!! Anyway I will try to return here someday soon but for now I leave you with some of the results. 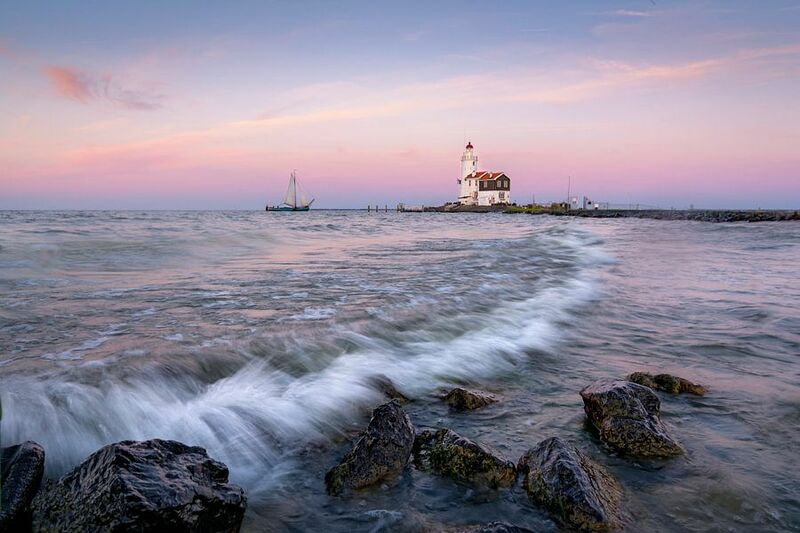 Sitting on top of my bucketlist for as long as I can remember… The Awesome lighthouse ‘Het Paard van Marken’. A classical long exposure shot of the lighthouse ‘Het Paard van Marken’. Taken on the Isle of Marken after the trip to the iconic lighthouse of Marken. Tagged Landscape, lighthouse, marken, photography, sunset.